Elaine Welteroth Is One of Media’s Brightest Stars. Here’s How She Keeps From Burning Out. As Welteroth moves forward in her skyrocketing career, she’s setting an example for her growing legion of admirers of how to be a trailblazer and also take care of herself along the way. Here’s how she does it. Welteroth practices meditation consistently, even if that means just once a week. The first time she joined a friend for a meditation class, Welteroth was convinced the practice “wouldn’t work” for her. But that day, she experienced the healing powers of meditation. “I felt it happening,” Welteroth said. About five years ago, Welteroth had an epiphany about her life. “I had — from the outside looking in — a perfect life, great career, boyfriend, everything,” Welteroth said. One day, her roommate asked why she looked so upset when she got home from a busy day at the office. “I was just like, ‘Because someone asked me what my hobby is and I can’t think of a single thing that I like to do apart from work,’” Welteroth admitted. That’s when she realized she needed to start doing something for herself at least one day a week. From then on, meditation became a huge part of Welteroth’s life. Welteroth is very self-aware. She knows her phone addiction is affecting her life and is trying to make a change. 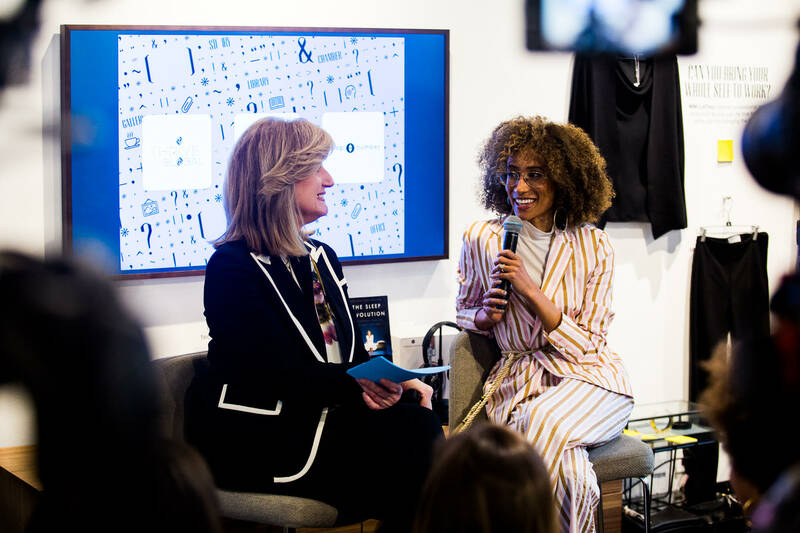 Inspired by young people like Amandla Stenberg who are starting conversations about smartphone addiction, Welteroth sets boundaries on her own device. She’s become stricter with postings (no selfies allowed!) and is mindful of how long she’s scrolling down on a social media feed. When Welteroth does share content, she shares with purpose. “I have to make sure that I am good and that whatever I’m posting is true to where I actually am,” she told Huffington. Putting these rules in place means being less impulsive, and using technology as a platform to share stories and connect with others. Welteroth knows she has more work to do in this area and told Huffington she’s up for the challenge. Leaving Teen Vogue may not have been the easiest choice, but it was an important step in her ongoing professional journey. These days, Welteroth has her hands in a number of projects. From diving into the land of television to new opportunities with Netflix, she is boosting her resume (even more!) with fresh, new content collaborations. “It’s been really really exciting. You know what it is in a word? It feels like liberation,” Welteroth said. It’s easy to lose your sense of self when your career is moving so fast that you barely remember to eat dinner. Welteroth knows firsthand because she’s been there. “I’ve learned to embrace my own authenticity, to listen to my instincts and to let that guide me,” Welteroth said. And while her instincts might lead her to new places and uncharted terrority, Welteroth finds joy in expressing herself and wants the young girls watching her to experience this too. “We all contain multitudes and you can have dynamic conversations that span beauty, fashion, politics, identity, race, religion,” Welteroth told Huffington.